Collections of artifacts and documents are the heart and soul of any museum. The public sees glimpses of it in the items and images on display during our one or two themed exhibits each year, but most are carefully stored away for posterity. The Hoboken Museum’s first exhibition, “Hoboken’s Changing Scenes,” opened in November 1986 in display cases at City Hall, featuring vintage postcard views of early 1900s Hoboken, side-by-side with present-day photographs. Museum founder Jim Hans donated the postcards to inaugurate the Museum’s permanent collection. 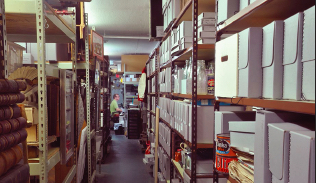 Catalogued, digitally scanned and packed in archival boxes by David Webster, our former Collections Manager, the Museum’s collections grew to over 100,000 items during his tenure. After David passed away in 2015, the Museum created the David Webster Memorial Fund to begin raising funds to expand and modernize our collections operations.The Museum’s collections have been growing ever since, through generous donations, strategic purchases and salvage, such as racks of police mug shots from the 1920s, or business signs like Apicella’s leaping swordfish and the 12-foot-high neon “Last Drop” from the iconic Maxwell House Coffee sign. Our space (pictured at right) is maxed out. 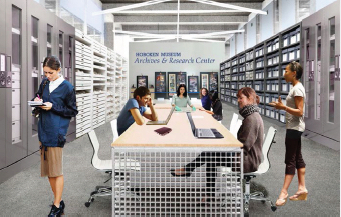 To date, we have raised over $40,000, with a goal of raising $100,000 to create The Hoboken Museum Archives and Research Center (conceptual rendering at left), where we can welcome visitors and researchers to explore Hoboken’s history, and our new Collections Manager, Randolph Hoppe, can continue cataloguing and digitizing our ever-expanding collections. Any amount is appreciated, just choose one of the categories below. To donate your own amount; simply scroll down to click on the button in the lower right corner.